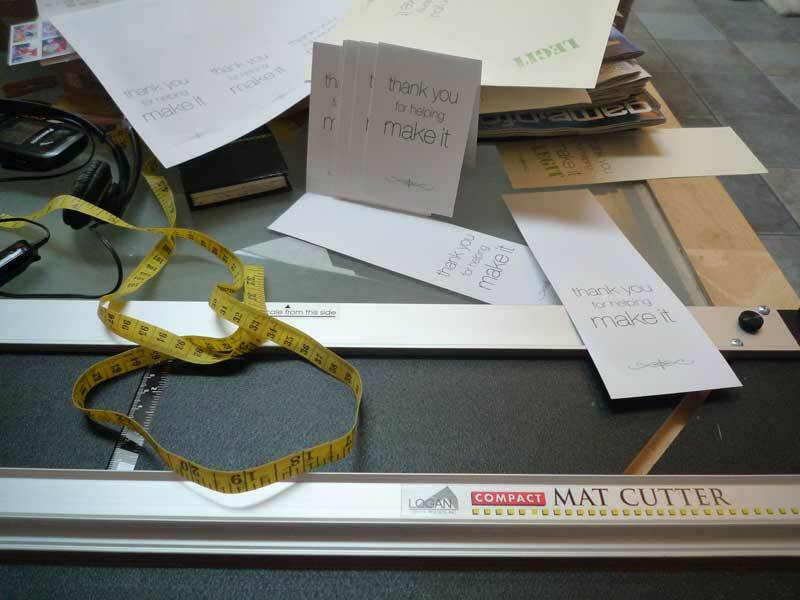 This year, instead of spending my creative energies on a holiday card (doh) I focused on creating a “thank you” gift for Make It Legit. What started out as a theme for my blog became my business name when I decided to strike out on my own this last year. Though there are many people to thank for their kinds words and support, there were a handful of people (okay, maybe two handfuls) that were pivotal in making this a success. These are the people who alerted me to opportunities, stood by me as references, and/or were my key client contacts that made it happen. I wanted to thank them properly at the end of the year. This was one of those ideas that popped into my head nearly fully formed. 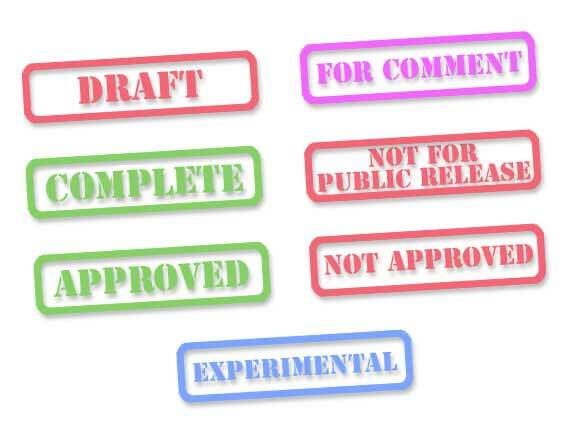 I think it may have been my subconscious harking back to the first assignment I had at my first post-college job: creating stamp graphics to use to indicate spec states (draft, final, etc.). I tracked down that file so you can bear witness to the folly of those unnecessary drop shadows…I will only say in my defense that the team liked and used them, and they looked pretty reasonable at the time. I wanted to make some kind of physical good that would be interesting-looking and potentially useful. 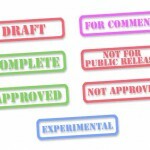 An old style wood-handled rubber stamp fit the bill. I got these made at Simon’s Stamps where I also bought simple stamp pads. Gotta make ’em usable right out of the package! 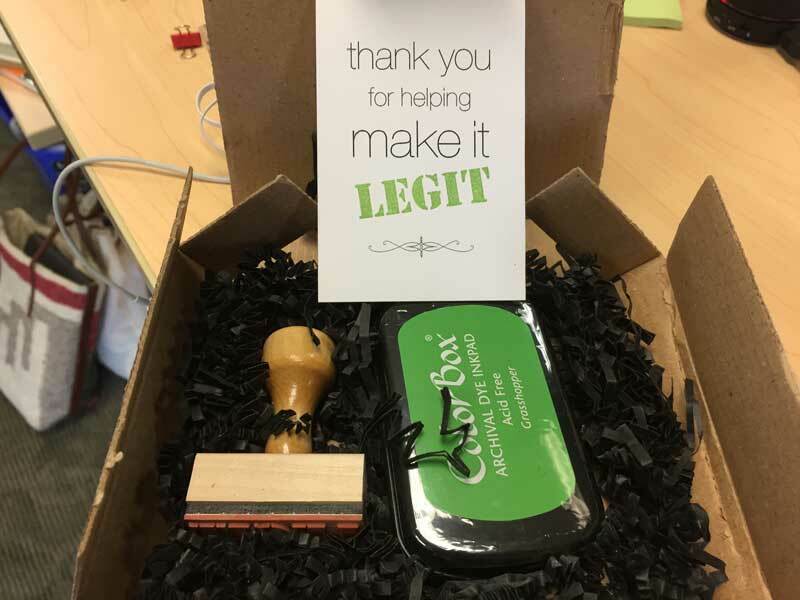 I hadn’t ever thought of a brand color for Make It Legit since my logo is black and white, so I picked the “Grasshopper” ink because it was a cheery shade of green. It’s natural, it’s positive, it’s “go”. Why not? The card is designed in Illustrator, and after a few fruitless attempt to make my printer work with cardstock I took it down to Kinkos instead. I mostly eyeballed the size to leave a reasonable amount of room for the LEGIT stamp. 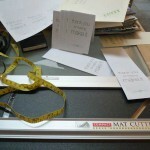 The mat cutter makes clean lines very easy, and a bone folder gave it the proper folded-card edge. The actual stamping was more challenging than I expected to uniformly land ’em centered and at a reasonably jaunty angle. Originally I was going to send these in bubble-wrap envelopes, but I wasn’t happy with the different ways I found to bundle the stamp, pad, and card. At one point I had cut cardboard squares and pseudo-shrinkwrapped them. I took a stamp and pad out for one last attempt to find the right-sized box. With the actual pieces in hand, I realized they’d fit perfectly in CD/DVD mailers. Plus: the way they fold means there’s a lid to open for a nice reveal of what’s inside. Double plus: by sheer coincidence, the cards I’d made fit perfectly in the opening to be seen first before discovering the rest of the contents. It was pretty involved but well worth it. I’m grateful for the people that made this happen, and am happy to already have a few folks on my 2015 list! **bonus: I got motivated enough to write up some career-ish thoughts about this project and the motivation behind it on LinkedIn. Go check it out!